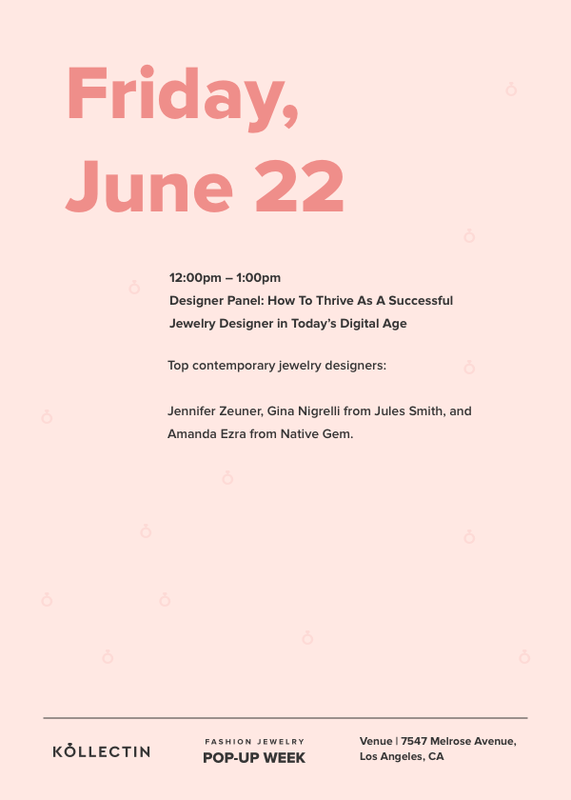 Meet top contemporary jewelry designers: Jennifer Zeuner, Gina Nigrelli of Jules Smith, Amanda Ezra from Native Gem, and Dawn Baiden from Lucky Star. Join the discussion as they share their experiences as creative women entrepreneurs, and discover how they continue to thrive and in today’s digital age. Jennifer Zeuner Jewelry is based in Boca Raton, Florida. Her pieces reflect her style; simple with a spiritual twist. People who have unique style inspire her, she loves it when people put things together in a creative, yet unexpected and cohesive way. Cameron Diaz was the first celebrity to buy Jennifer Zeuner’s jewelry almost ten years ago. She was extremely honored because she considers Diaz’s style an inspiration. Since then, many stars including Jennifer Lopez, Beyoncé, Jessica Alba, Taylor Swift, Miranda Kerr, Rihanna, Sarah Jessica Parker, and countless others have been spotted wearing her jewelry too. As founder of Jules Smith jewelry, Gina Nigrelli-Smith has forged a dynamic brand with a uniquely inspired identity. A former ballet dancer and fashion editor, Nigrelli-Smith studied at NYU in the heart of Greenwich Village. With New York as her backdrop, Nigrelli-Smith crafted a style of her own that is bold, indie and most importantly, authentic to her gypsy soul. Her collections draw inspiration from a love of juxtaposing luxe details and architectural lines with organic shapes and unexpected nods to the past. Whether designing in the studio, commenting on style onscreen, or sharing her experiences as a woman in business, she is consistently on the go in search of her next inspiration. Native Gem designer, Amanda Ezra draws experience from her decade-long career in the fashion industry and seeing an unfulfilled demand in the market for quality, unique, collectible jewelry at attainable prices for women of all ages. The pieces are designed to be worn, using only hypo-allergenic, 14K gold fill, vermeil and sterling silver. The collection is coveted by some of the most beautiful and fashionable women in the world, including Halle Berry, Sarah Jessica Parker, Carrie Underwood and Cara Delevigne. Designer Dawn Baiden has been an entrepreneur for over twenty years, having begun her career designing couture apparel and accessories for both women and children. A special request from a women’s boutique inspired Dawn to create her own line of fashion couture jewelry, now famously known as Lucky Star Jewels. Passionate about color, Dawn’s designs are inspired by her own travels to Europe and the far corners of Southeast Asia. She intuitively blends semi-precious stones with brand-exclusive artisan-crafted beads.